I am not sure what impressed me most in Segovia. The Medieval atmosphere, the splendid architecture, the cozy cafes, the narrow paved streets, the marvellous castles, the huge aqueduct, the craft studios, the breathtaking views, the colourful multilingual crowd, the archaic firefighting tracks, the perfectly maintained gardens, the sense of chivalry…To explore all of them in a day trip, I followed my perfectly organised TO DO list. Haven’t you ever heard of Segovia? Well…briefly described, it’s a soaked by history Spanish city, 80 km away from the capital Madrid. But it’s not a Spanish city, which is easy to describe. I guess, it already sounds too complicated, so let me simplify it. 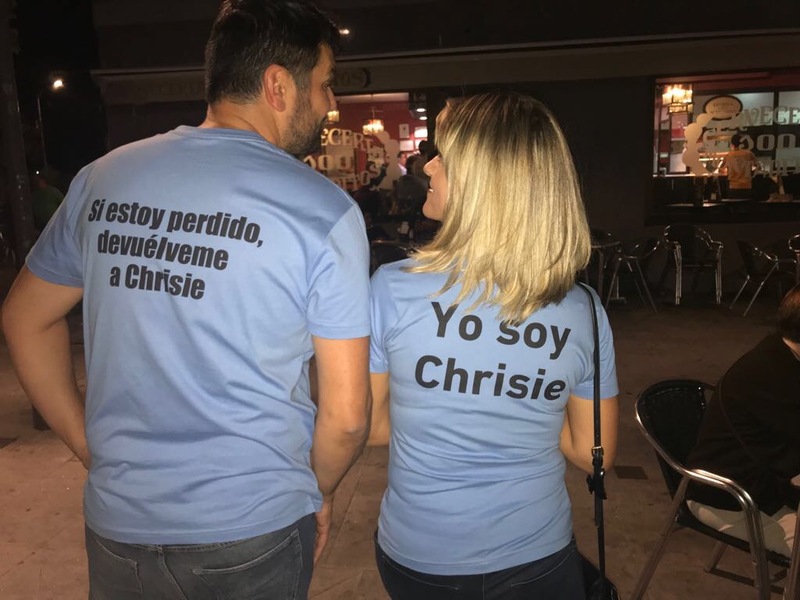 I thought nothing could ever surprise me in Spain, after having my only brother living there for almost two decades and after visiting that super vibrant country about 10 times. But I was wrong. Previously I’ve been to Madrid, Barcelona, Valencia, Toledo, Canary islands (Tenerife and La Gomera), Vinaros, Benicarlo, Alicante, collado Viallba and plenty of small villages, whose names I can’t recall right now. I liked all of them, but what truly impressed me and turned to be a lifetime memory was definitely Segovia. I can hear right now disagreements from some readers. Everyone has right to like or dislike different stuff, so I won’t try to convince you Segovia is the best place to visit in Spain. There are plenty of beautiful spots on the Pyrenean peninsula to attract the travellers. But you should see Segovia through my eyes. To feel that tickle of curiosity, which drove me on the top of the wave during a hectic trip. To buzz the thrill of exploring and absorbing every single detail around, greedy for learning more and digging deeper into the story. I reached Segovia by car, after lots of frightening road curves. Fresh greenery, amazing scenery and plenty of quiet villages surround the route to Segovia. Do not miss them! 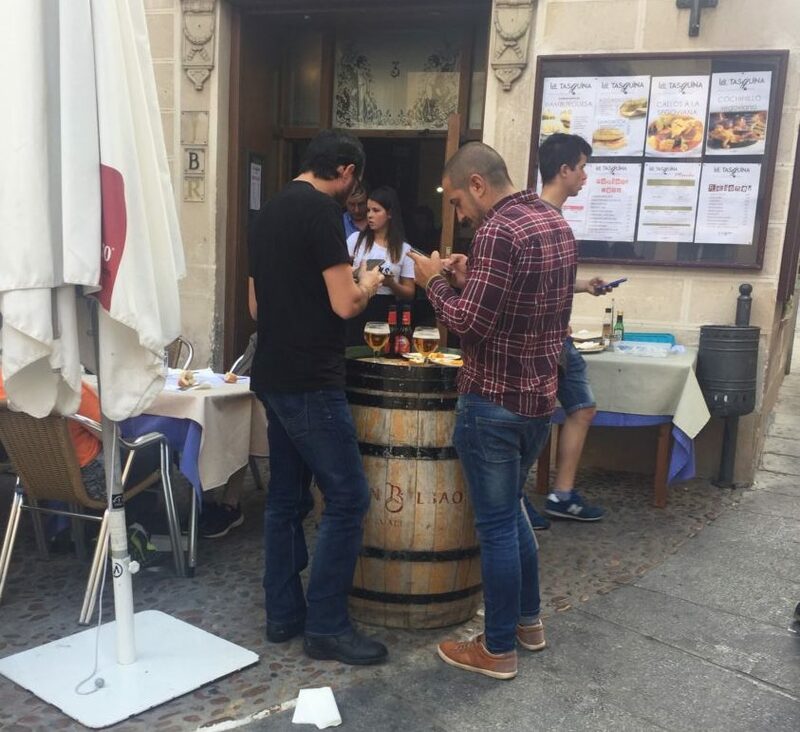 Stop somewhere, taste the local tapas (traditional Spanish appetizers) and enjoy the native locals’ company, while drinking a beer or two. Do not worry, no one here speaks English, so the adventure is guaranteed. 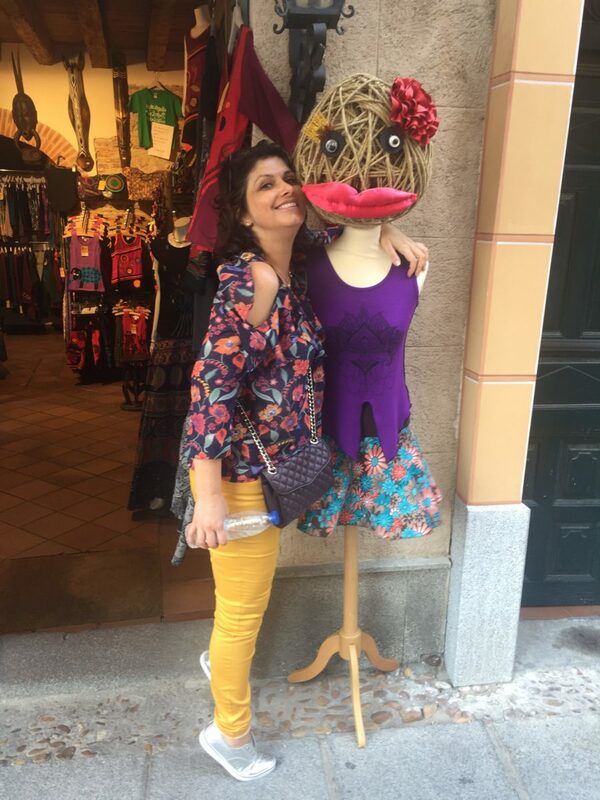 The native locals are curious, friendly and extremely hospitable. They would welcome the chance to explain to you in loud Spanish whatever they could, satisfied of being supportive. Restlessly will repeat the information you asked for, usually accompanied by gestures, until they were convinced you finally got it. If you try to speak even some broken Spanish, it will be warmly accepted and appreciated. That’s a pretty popular place, in the field of the mountains, where the greatest Spanish Royalties were buried. It doesn’t look like a cemetery though. It’s kind of a monastery, but to me it looked like a Medieval castle, as most of the buildings nearby. The place is tranquil. The only alive inhabitants, except the tourists, are the thousands of birds (not sure, but looked like swallows). It seemed to me like they conquered the ancient premises and made them home. All the detailed information could be found on Internet (when you see an orange coloured underlined paragraph wherever in my articles, just click on it, usually some helpful information is hidden behind the link). It stands tall like a widely open huge gate just at the entrance of the city. Shockingly enormous, extremely well preserved, this architectural prodigy is now one of the symbols of Segovia. The aqueduct is 20 centuries old, built by the Romans in 1st century AD. The idea of the construction was to transport water from Rio Frio (Cold River), which is 17 km away, to the city. Isn’t it impressive? It is 800 meters long and 28 meters high. 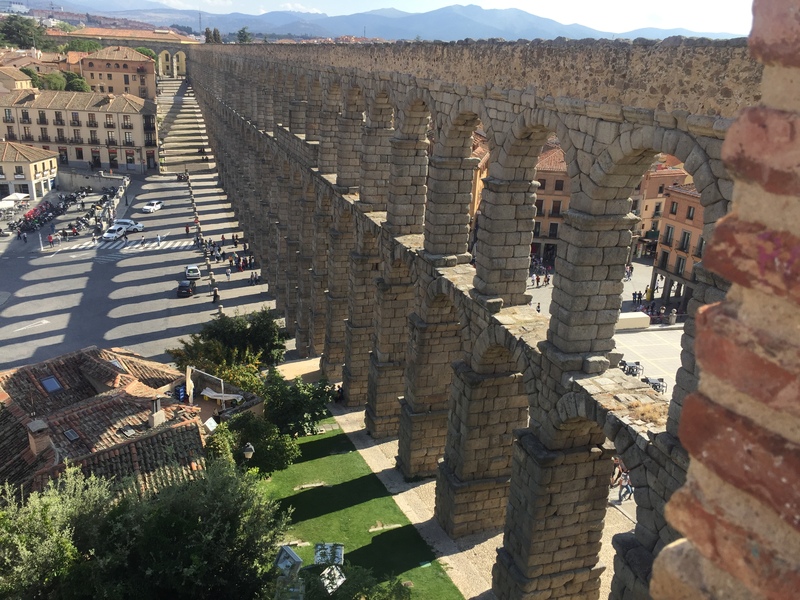 I was told it provided water to the city of Segovia till the mid of 19th century, so in fact, before becoming an important landmark, the aqueduct was serving the locals for almost 19 centuries and is still in excellent condition. There is a terrace at the right side of the construction, where you can take memorable pictures. Also the bottom of the aqueduct is a preferred frequently used spot for picnics and relaxation. It won’t be wrong if I say the whole city looks like a postcard, taken hundreds of years ago in the Mid centuries. There are plenty of buildings, shaped between XII and XV century. When you walk the narrow, paved streets, full of history, you can’t skip being impressed by the perfect condition they still are in. I was unable to stop staring at the stony houses around, which are so …lively and fresh. From one side, the city is a divine background for historical movies, but from another side, it pretty much lives life to the fullest, by successfully combining past and presence. That’s the most spectacular and the most magnificent sightseeing of Segovia – Alcazar castle. It’s not actually correct to call it “Alcazar castle”, because in Arabic “Al Qasr” means the Castle/the Palace. Obviously, the name is a heritage from the Moorish past of Spain. Built in XII century, this extremely well preserved castle became home for all the Spanish Royalties. It was the preferred place to live in for the most popular queen of Spain – Isabella I. Maybe even the explorer Christopher Columbus has climbed those stairs, while meeting the Queen in the end of 15th century, getting his official instructions for conquering the West Indies on behalf of the Spanish crown. Alcazar is awesome. I have no other word for this exclusive Medieval piece of the Spanish history. All inside, from the authentically decorated bedrooms, through the full of iron knights and original archaic weapons saloons, to the luxurious throne hall is outstandingly captivating. By the way, the entrance ticket is just 4 euro, quite affordable for the visitor. And on the left side of the entrance could be found some brochures in at least six different languages, so the tourists are well provided. I heard there is another Alcazar in the city of Seville, also spectacular, but I’ve never been there. Taking pictures and videos is free of charge. I mention it right here, because at other historical spots, photography is prohibited or quite expensively permitted. There is security though, who follows strictly the rules. You can take pictures with the iron knights, in front of whatever you would like to, but it’s not desirable to touch the exhibits. Especially the spears, arbalest and bows are strictly prohibited. In case you do not speak Spanish, the note NO TOCAR means in Spanish DO NOT TOUCH. So better beware it and skip the embarrassment. I know the tourists and especially the travellers are naturally curious, but I would recommend you to be moderate. The local rules are quite tolerant, but also have limits. Here we go. 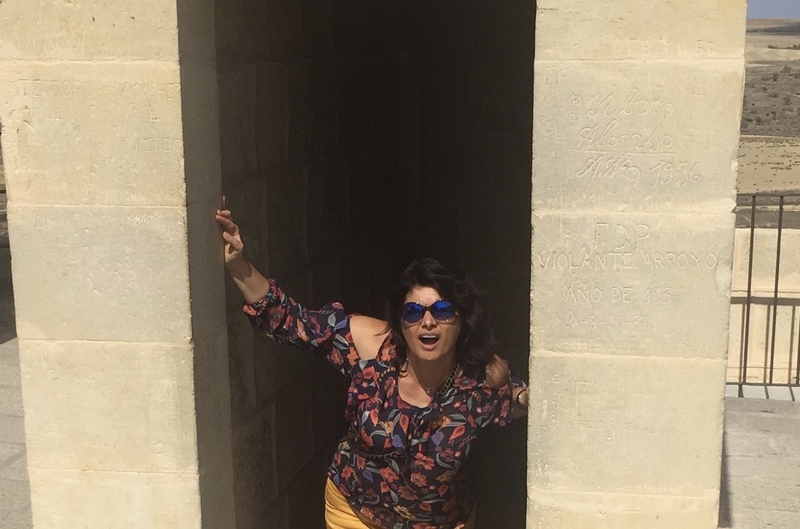 It’s thrilling, exciting and panting experience – The Tower of Alcazar. The tallest building of the complex. I would recommend not to ignore it. It’s easy to be missed out, because the tower is not part of the Alcazar main tour. When you are about to exit the palace, turn right and move to the entrance of the tower. The stairs are narrow and steep. It’s difficult to pass the other visitors, who go down, while you are climbing up. And there are two tricky interstellars, which make you think you are almost there, you made it, but then comes a new ladder to climb. Keep going, it’s worth it. And when you reach the top, it doesn’t matter how you got on there, on foot or crawling on knees and elbows. The way back is much easier. What you will find on the top, deserves the efforts. I know it looks hard to climb the Tower’s stairs, but just do it. I promise, the Top of Alcazar Tower offers breathtaking view with 360 degree panorama. The view to the city of Segovia is amazing. You can see the nearby mountains from birds eye, to enjoy the otherwise scary snapshot of the deep ditch, surrounding the whole castle(protection from potential intruders). 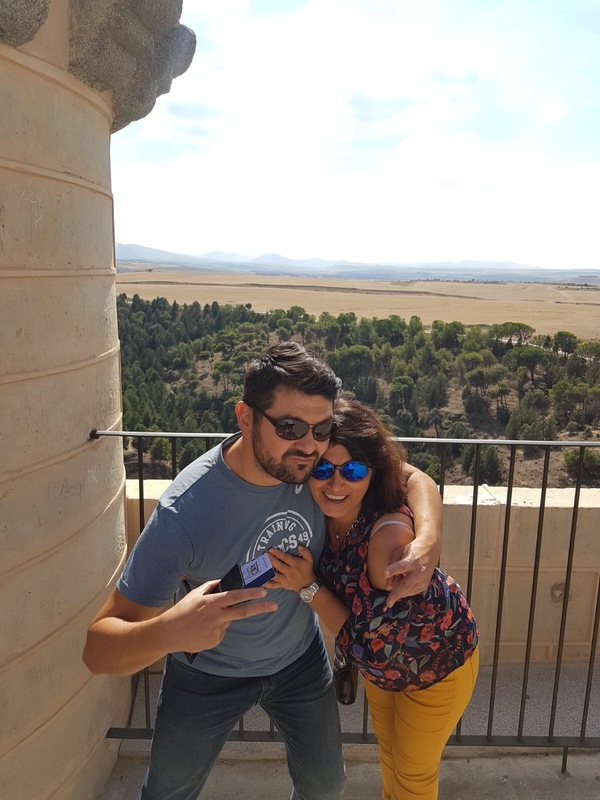 The Tower’s top is the greatest place to realize the calibre and the splendour of Alcazar castle, to discover some extra “architectural pearls” of Segovia, not visible from the bottom. Also a fantastic spot to take memorable pictures, selfies, videos or to mingle with the other “climbers”. The streets of Segovia look like an endless exhibition of local art and crafts. I do not mean just the souvenir shops, full of small memory gifts. Starting from the wicker baskets, which could be found in different size all over the city, going through the local traditional stuff, related to the nearby castles and historical events, and ending with the colourful scarves, painted in customized nuances, right in the street. It’s arranged to simply catch your eye, to make you literally stumble right at the craft shop doorstep and to create a long lasting longing for having a piece of this magical artificial world. 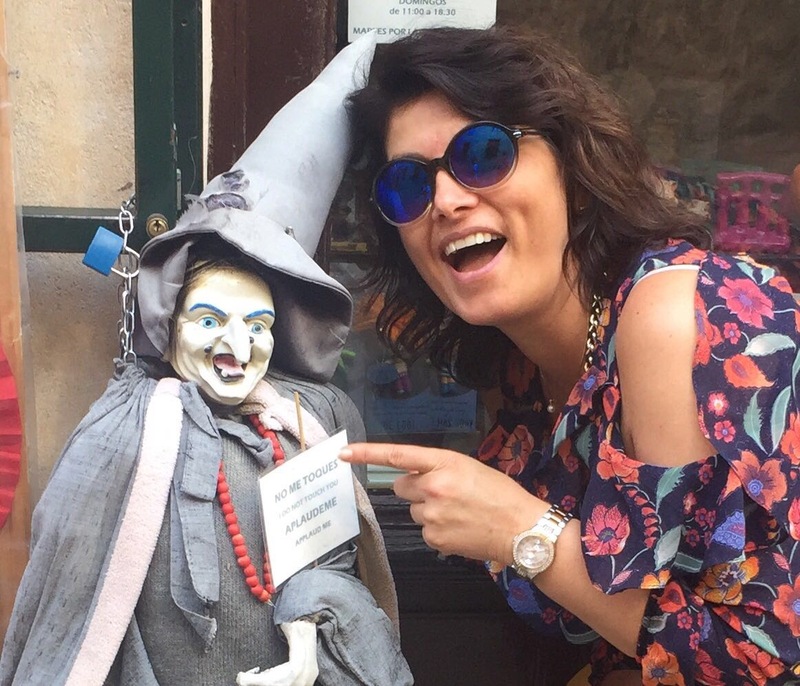 Witches, mannequins, welcoming small chef sculptures, cleverly cut wooden plates over the doors, guiding you to the right direction. Huge funny menus, reminding mostly geographical maps, clay figures at the windows, introducing the type of manufacture production. It looked to me like a competition between smart brains, to figure out a wiser and more unusual advertisement, for attracting extra customers to the local crafty output. What totally amazed me, was the brilliant purpose of that craft show. It possesses not only commercial side, but also challenges you to enjoy, be part of the game and eventually to fully entertain you. Briefly, the craft street exhibition of Segovia, provokes you to spend as much money as you can. The trick is you pay with no objection and even pass out the money with pleasure. I have never seen so many vendors and tradesmen, who are able to “seduce” other people’s money with such an elegance and ease, but at the same time to make you feel happy for emptying your pockets. I do not aim to scare you by mentioning bizarre food, but the truth is there are two local meals, which are pretty odd. In fact, you can order all the traditional Spanish dishes in here, but it doesn’t mean you have tasted Segovia’s specialty. The city is pretty famous with exotic for the region meals. The locals believe at least one of those meals gets its roots from Oriental past of the country, when those lands were conquered by the Moors, the Muslim inhabitants of the Peninsula. Even being too weird, I think it’s worth to taste that food, because you can find it nowhere else. Callos a la Segoviana is quite bizarre even to me, who has seen and tasted really awful and odd food all over the world. 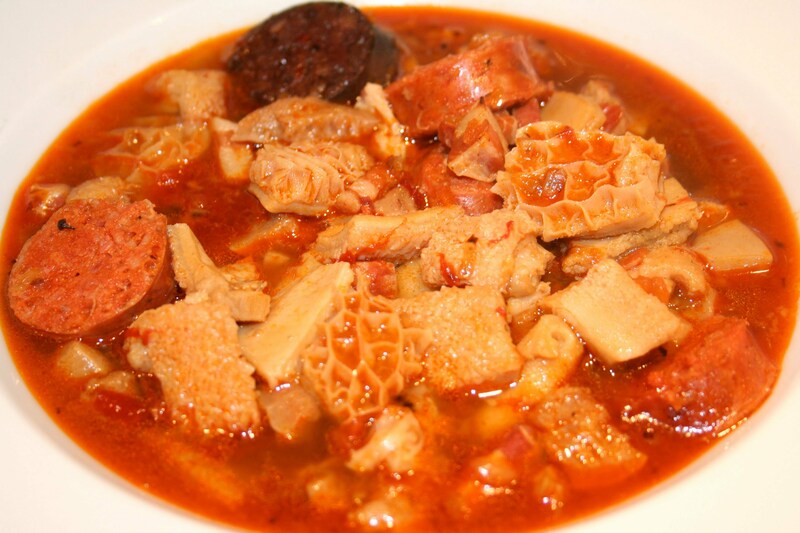 Callos a la Segoviana easily can beat most of them. See what’s inside the meal. Main ingredients: pork snout, beef tripe, beef or pork knuckle, onion. Imagine all those boiled for more than four hours. Then to the almost ready mix should be added thyme, paprika, garlic, black pepper. The final touch: typical local sausage, called Chorizo, cut on cubs plus another local blood sausage, called Morcilla. Cheers! Cochinillo Segoviano is roasted pork. To be precise roasted piglet, whole piglet. It should be cooked in a traditional wood-burning oven. Three hours of roasting in a pot of mud, covered by butter and water. Serving the dish is a special ritual. 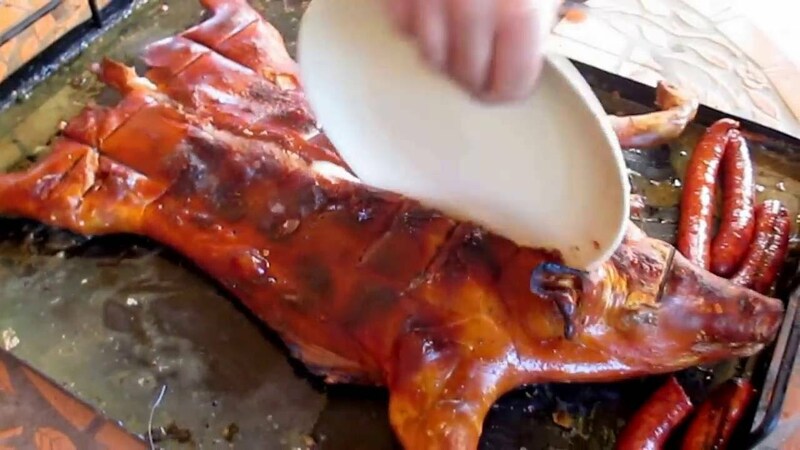 On the table, Cochinillo Segoviano is cut on pieces… by plate, which replaces the knife. This way the chef proves and certifies the tenderness of the meat. These absolutely impressive gardens could be visited on the way from Segovia back to Madrid. Built like part of the summer royal residence of the Spanish royals, the flowers, trees, sculptures, fountains and artificial lakes are beautifully designed to complement each other. The project was completed in the mid of 18th century, as a copy of the famous Versailles gardens in Paris. Nowadays it’s tranquil, perfectly maintained and frequently visited by tourists and locals. To me it looked very familiar at the moment I saw it. Later on, I realised why I had seen a resemblance. La Granja gardens and palace just looked like a twin of Schoenbrunn palace in Vienna, Austria, the summer residence of the Austrian-Hungarian empress Sissi. Probably at that time, the fashion style of palace building and gardens all over Europe was pretty similar. With those gardens my Segovia’s day trip bucket list is accomplished. 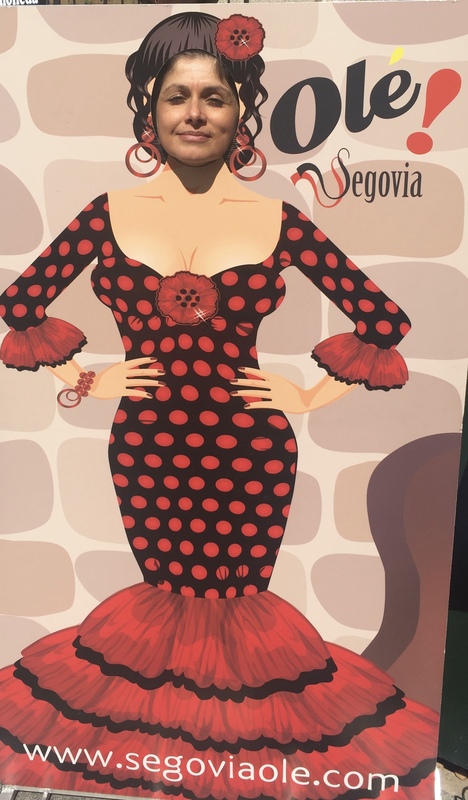 Do not forget to have fun, Segovia loves laughing and dancing 🙂 Check on the pic below and get prepared for the taste of the Spanish type of humour. 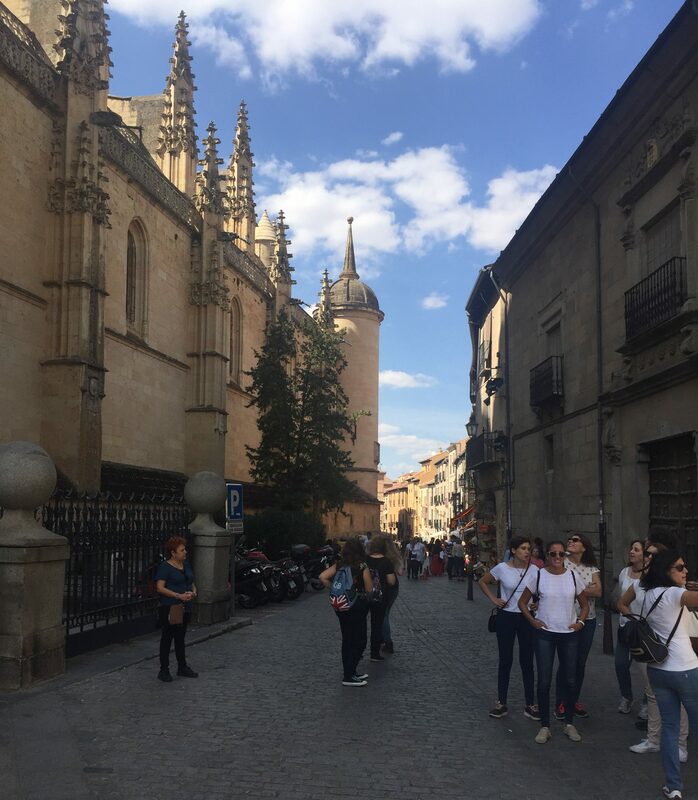 All here is “fiesta”, which means party, so let Segovia’s great mood conquer you and make it unforgettable with even just a day trip hectic agenda.